Before you accuse me of a typo in the first two ingredients of this recipe—um hello questionable kveller, don't tell me you mean to intentionally combine the all-encompassing umami Asian flavor of miso with the distinctly spicy, capsicum essence of Moroccan cuisine's harissa?— let me assure you it is not. Ever since I saw these two incongruous tastes paired together in Miso Harissa Delicata Squash, I've had my eye on this recipe. 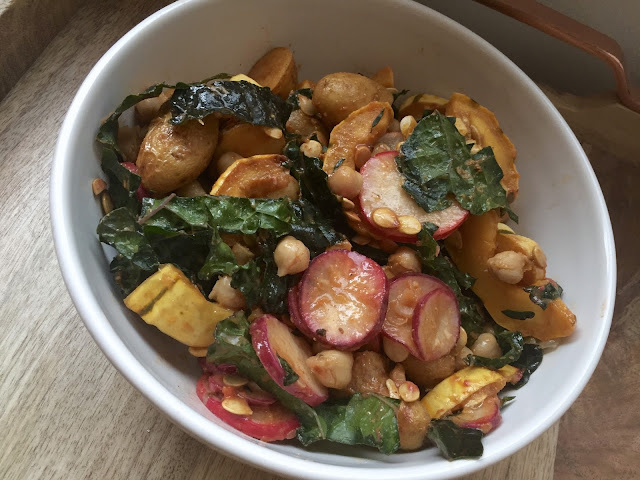 Last weekend I came across all the main ingredients at the Greenmarket—kale, radishes, and fingerling potatoes play a supporting role in addition to the delicata namesake— so it was finally time to fulfill my curiosity of the marriage of these bold, distinctly different flavors. 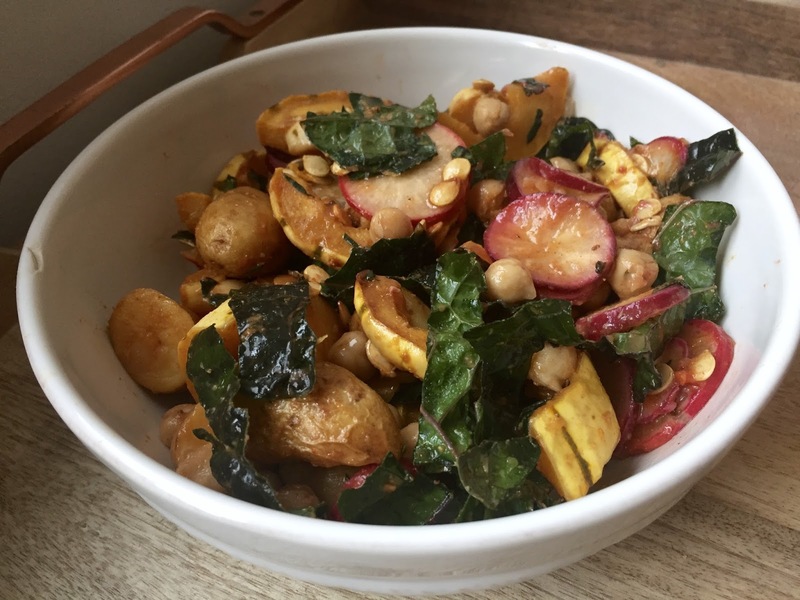 The result was a dazzling, daring flavor bomb of spicy, sweet, and salty that transformed these sometimes overplayed fall-forward vegetables into an exciting and edgy novel dish. It's simple, really. The salad is very good. And the fact that it's dressed in an unusual blend of known, but rarely mixed, flavors makes it even better. There is sweet, thanks to the inherently honeyed delicata squash and sugary miso; and there is earthy, thanks to the starchy potatoes and bitter kale. These two profiles play beautifully off each other, ensconced in tinges of harissa components cumin, coriander, and chili pepper. Biting radishes and toasted seeds give crunch to the tender baked vegetables. The salad is best served warm, though room temperature is fine, too. The recipe is extremely efficient with its time allotment. You can prepare all remaining ingredients while the squash and potatoes are roasting, so upon their completion (which is only 25 minutes, not the protracted 50 minutes of a sweet potato or spaghetti squash) everything else is already sitting in one large bowl. Their transfer finishes the recipe. The hearty dish feels like a main, so I added a can of chickpeas for protein to secure that title. The original recipe calls for roasted almonds, but I subbed in the toasted seeds from the delicata. If you don't want to roast those seeds but stay in the squash family, toasted pepitas also suffice. One more note: I doubled all the vegetables (reflected in recipe) but used the called-for amount of harissa/miso, as both ingredients are very pungent. I thought the vegetables were dressed just right, so I suggest erring on the side of less harissa and miso. You can always add more once the vegetables have roasted. *Both of these ingredients are available at mainstream markets like Whole Foods and Fairway. For those who live in NYC, try Taim harissa paste. It's the best! 1. Preheat the oven to 400F degrees. If the potatoes aren't tiny, slice them into pieces no larger than your thumb. Cut the delicata squash in half length-wise, and use a spoon to clear out all the seeds. Cut into 1/2-inch wide half-moons. You can leave the peel on these squash. 2. In a small bowl whisk together olive oil, miso, harissa. 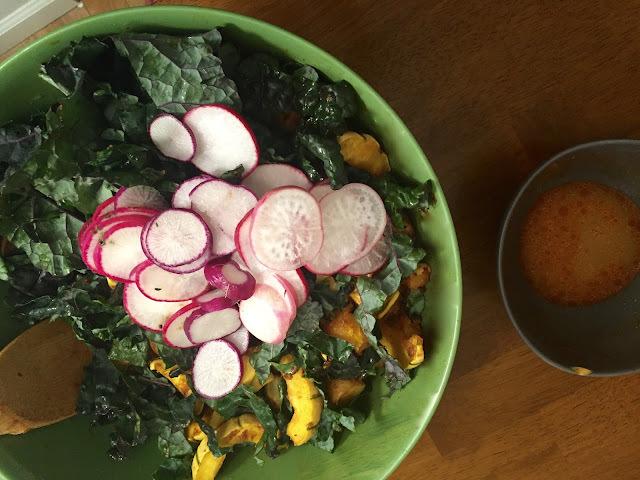 Place the potatoes and squash in a large bowl with 1/3 cup of the miso-harissa oil. Use your hands to toss well, then turn everything out onto a baking sheet. Bake until everything is baked through and browned, about 25-30 minutes. Toss once or twice along the way after things start to brown a bit. Keep an eye on things though, you can go from browned to burned in a flash. 3. In the meantime, whisk the lemon juice into the remaining miso-harissa oil. Taste, it should be intensely flavorful, but if yours is too spicy or salty, you can dilute it with a bit more olive oil or lemon juice. Stir the kale into the leftover dressing and set aside. 4. 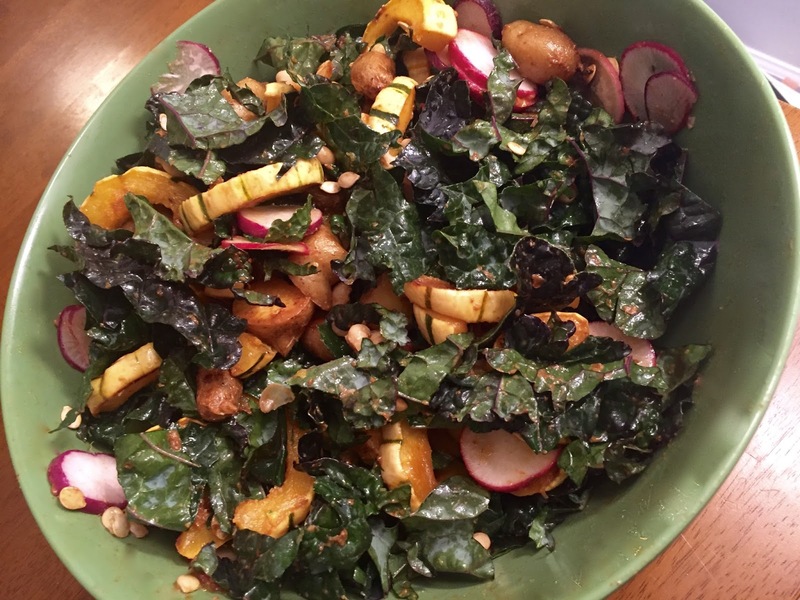 Place the warm roasted vegetables in a bowl and toss with the kale mixture, radishes, seeds/almonds, and chickpeas (if using).